Hi there sweet friends and happy Wednesday! 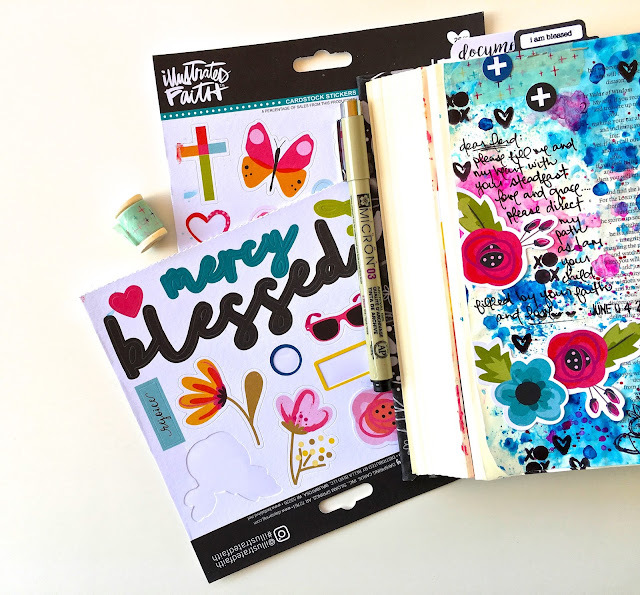 Today I wanted to share a bible journaling page I created using the latest Citrus Twist GraceBox Kit and the most common process I use when I'm bible journaling, especially when using watercolors. First, I always prep the page with clear gesso. My two favorite tubes of gesso are from Dina Wakely and Prima. Both will give you very nice, smooth coverage and will prevent the watercolors from transferring to the opposite page. To apply the gesso I have a bowl of old gift cards I use to "scrape" it across the page. When I first started using gesso I was struggling with how to scrape it on the page without ripping it. Since the pages of a bible are usually super thin, the best way to apply it is to turn the bible sideways with the page turned closest to you. Put your bible mat, cardboard or a piece of cardstock under the page so you don't transfer the gesso onto the pages below. Grab your bottle of gesso and squirt it directly onto the page. 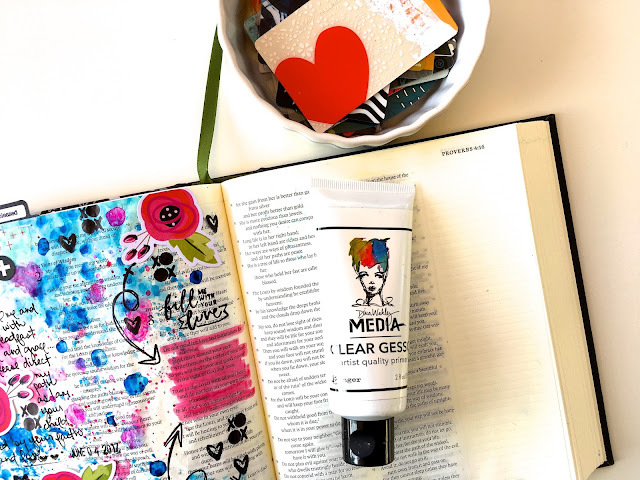 Take your scraping tool or old gift card and spread the gesso from the center of the bible toward you until you have covered the entire page or the area where you will be using watercolors, stamps or any medium that you do not want to be seen on the opposite page. Since I'm really impatient I use a heat tool to dry the gesso. Your page will be a little wrinkled and feel limp, but that is totally normal. There are many ways and different techniques that can be used to create a watercolor effect. For this particular page I used some plastic packaging I had laying around. I added watercolor directly to the packaging and "smooshed" it onto the page in the areas I wanted color. Through a lot of trial and error I found one of the most important things to remember when using watercolor is to let each layer dry before adding another and that each time water is added the layers of color will react. So, have fun experimenting and if you're feeling nervous try experimenting in an art journal or notebook, etc. something that is not important if you mess up. 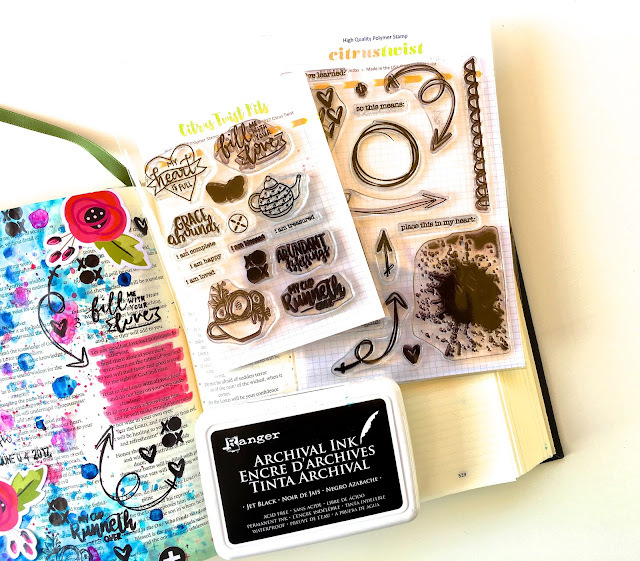 One of my favorite things to do in my journaling bible is to stamp. Whether it's florals, patterns or in this case, hearts, phrases and arrows. When stamping and using watercolors or any form of mixed media the archival ink from Ranger is my go to. The awesome thing about archival ink is, once it's dry it's permanent. You can use any form of mixed media and it will not effect your stamped image. It's truly magic and hands down the best option. I like to add stickers, washi tape, die cut cardstock pieces, tabs, etc. anything that will add that "finishing touch." Lastly, and most importantly, I make sure to leave room in the design for journaling. Sometimes I have a long message, whether it's a prayer that I have for my girls, husband, mother or talking directly to our heavenly father. Sometimes I'm thanking Him for all of the gifts he has bestowed upon us. Whatever he is putting on my heart is what I want to document. For journaling my favorite "go to" pen is the Micron .03 or .05. Once dry it never smears. 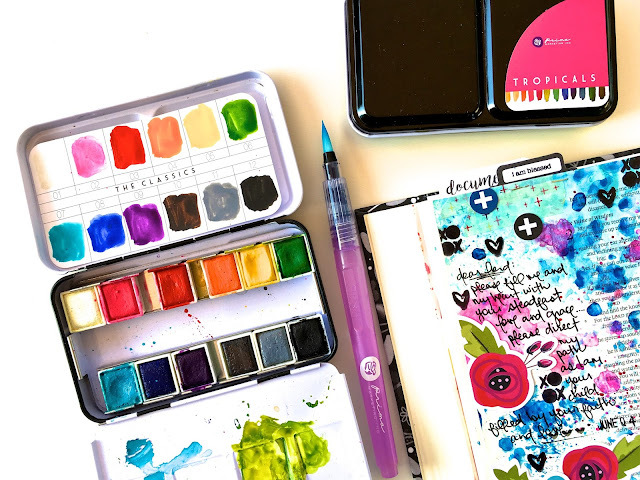 One of the things I love most about the Citrus Twist GraceBox Kit is the exclusive, wonderfully designed, stamp sets and journaling cards and the amount of embellishments that seem endless!